It has been nearly a decade since Egyptian author and Qur’anic scholar Nasr Abu Zayd passed away but his intellectual legacy continues to influence VCU Religious Studies professor Esther Nelson. The two became close in the early 2000s when Nelson was living in Saudi Arabia and they collaborated on the book “Voice of an Exile: Reflections on Islam” in 2004. Earlier this month, Kuwaiti news outlet Subahiya News interviewed Nelson about her recollections and reflections on Zayd. While the French Film Festival is an obvious draw for students of French and cinema, it will be showing movies of interest to majors from all disciplines across campus. Thierry Lhermitte has been a famous heart throb and comedic actor in France since the 1970s when he made his debut as part of the comedy troupe “Le Splendide.” Here in Virginia, Lhermitte is also a cultural ambassador who was the first actor to personally present a movie at the French Film Festival. He returns to Richmond this year as an honored guest for not only a screening but also a master class and homage. Like VCU as a whole, the French Film Festival is grounded on core values centered on inclusivity and social justice. The four themes guiding the selection of films this year are: human and civil rights; immigration; reconciliation; and environmental engagement. Some movies focus strongly on one specific theme while others deal with multiple issues. As part of this year’s French Film Festival, VCU’s Institute for Contemporary Art state-of-the art auditorium will be home to eight free master classes with the Festival’s creative talent. Held on Thursday, March 28 and Friday, March 29, these classes offer insight into the art of filmmaking directly from professionals actors, producers and screenwriters themselves. Illegally obtained artifacts seized by the FBI in 2014 have just been repatriated to China last week in part due to the efforts of VCU alumna Liz Ale. Currently a Master’s student at Purdue University, Ale is part of a team of collections and repatriation consultants helping the FBI analyze over 7,000 objects from around the world which the FBI found in an Indiana home. Studying abroad has been integral to VCU student Ashley Leahman’s life; she spent her junior year of high school in Zaragoza, Spain and is currently at University of Leiden in the Netherlands. Earlier this month, the Honor Society of Phi Kappa Phi recognized Leahman’s commitment to international education by awarding her a $1,000 Study Abroad Grant. While the crisis facing undocumented children in the United States can seem overwhelming, the VCU community is rallying around this cause through a collection drive called “Solidaridad y Apoyo en Richmond” (Solidarity and Support in Richmond). The drive will culminate Wednesday evening at 6 in the Siegal Center as part of a public lecture by Valeria Luiselli, author of “Tell Me How It Ends: An Essay in Forty Questions,” a book about the plight of undocumented children facing deportation from the United States, and Virginia Commonwealth University’s 2018 Common Book. Neha Pondicherry, a VCU Junior double majoring in International Studies and biology, decided to start the School of World Studies Society to help students across the school’s four interdisciplinary programs feel more connected to each other and cohesive as a unit. The group met for the first time last week to discuss their goals, upcoming events and leadership opportunities. Presented by VCU’s School of World Studies, the 2018 Student Research Conference is only days away and promises to showcase amazing undergraduate scholarship as well as a powerful keynote speaker. The conference will be held on Thursday and Friday, November 8 and 9 in the VCU Student Commons and features over 60 student presentations on topics ranging from the micro-culture of Catalonia, Spain to gentrification in Richmond. Assistant professor of Religious Studies, Isabelle Richman, Ph.D., J.D., received the faculty award for student support due to her work as adviser to the Association for Students with Disabilities and Chronic Conditions, a newly founded student group with about 40 members. The Jewish deli holds a special place in the American culinary landscape at large, but is especially important for American Jews interacting with their community and culture. Rachel B. Gross, the John & Marcia Goldman Professor of American Jewish Studies at San Francisco State University, will discuss the evolving role of the traditional deli for Jewish Americans on November 26, 2018 at 6 p.m. in Room 1107 of the Academic Learning Commons. The Exorcist is an iconic film, but merely a fictional depiction of a dramatic spiritual rite actually performed by real people. Adjunct Professor of Anthropology at the University of Alberta, Canada, Dr. Kate Kingsbury explores the reality of exorcism as practiced in Africa and Latin America in her upcoming lecture Demonic Deliverance to be held on Monday, November 12 from 4 to 6 p.m. in Hibbs 407. Due to high demand, the deadline for submissions to the 2018 Student Research Conference has been extended to Friday, October 5, 2018. Most people don’t associate death with beauty, but Paul Koudounaris’s work is perhaps best described as “haute macabre” for the ways in which he explores the interplay of artistry and burial. For more than a decade, the art historian and photographer has been capturing the bizarre beauty of human remains used as decorative elements in sacred spaces that would put a haunted house to shame. He will be discussing bejeweled skeletons from the Counter Reformation on Tuesday, Oct. 2 from 4 to 6 p.m. at VCU’s Cabell Library Lecture Hall, Room 303. Students and their parents have more options than ever when it comes to choosing a school that best reflects their values and priorities. Catholic education remains a popular choice for many American families today. The upcoming VCU lecture "The Importance of our Urban Catholic Schools" on Tuesday, Sept. 18 from 4 to 6 pm in Room 303 of the Cabell Library Lecture Hall will explore the ongoing role of Catholic schools in Richmond and beyond. Archeology uses material evidence to uncover the truth about the human past, often undoing long-held assumptions and inaccurate understandings of early human societies. Anthropology professor at VCU’s School of World Studies Matthew Pawlowicz’s work in Zambia hopes to uncover the actual lifestyles and worldview held by those who lived in the central part of the country during the Bantu Expansion from 500 CE to 1500 CE. Jonathan Waybright, instructor of religious studies and internship coordinator, has connected VCU students to archaeological projects in Israel for the past 25 years. Since 2009, VCU School of World Studies students have participated in Hebrew University archaeological field schools at Khirbet Qeiyafa, Tell Lachish, and recently, Khirbet Arai, Israel, celebrating a decade of partnership. Amy Rector, Ph.D., assistant professor of anthropology, contributed two recent articles to RVAMag.com - one on her research in South Africa's bone vaults and another offering a critique of a recent RichmondMoms.com article on being a mother in RVA. Dr. Means’ project “Building a Virtual and Real Exhibit of India’s Past.” will formalize a partnership with Dr. Vinod Nautiyal of HNB Garhwal University, India, involving 3D scanning of artifacts recovered from excavations in the Trans-Himalayan region. Chesterfield’s central library will host the exhibit that covers many of the same themes that explore the evolution of man over 6 million years. The exhibit itself will include panels, public talks, hands-on displays and videos. Dr. Amy Rector will be conducting some of the panels and public talks. The “Exploring Human Origins” exhibit is a part of the Smithsonian’s Human Origins Initiative. Out of 1,000+ applicants,two Italian students from VCU were selected to join a group of 60 students to represent the United States as an Ambassador for 'Wave 2' of Expo Milano 2015. Mariana Zechini forthcoming publication is titled ‘Digital Zooarchaeology: Using 3D Technology on Archaeofaunal Collections’ and will appear in the Quarterly Bulleting of the Archeological Society of Virginia. Along with a team of some of the best researchers in the world, Dr. Stevenson researched and developed new techniques that changed the debate about human history and the demographical dynamics on Easter Island. Bernard Means, VCU professor of anthropology and Director of the Virtual Curation Laboratory, to give Makerbot's monthly webinar on Tuesday, January 20th from 3:00-4:00pm. Sponsored by the VCU Institute for Women’s Health, the October 13th VCU in French-Speaking Africa forum focused on joint clinical trials of a probiotic supplement for HIV-positive women in Ségou, Mali. Kunal Kapoor, Fulbright Scholar and Religious Studies Alumn, to speak at TEDxVCU. This past weekend, October 10-12, the Virtual Curation Laboratory (VCL) presented some of their work at the Archeological Society of Virginia (ASV) annual meeting, which was held in Richmond, Virginia. Congratulations to SWS students Lindsay Fitzgerald, Minsun Kim, Samantha McCartney, Luke Nelson, Amanda Radke and Taron Ware on their presentation at the 2014 FLAVA Annual Conference. Oliver Speck, Ph.D., an associate professor of film studies at Virginia Commonwealth University, is the editor of a newly published collection of scholarly essays exploring Quentin Tarantino's successful and controversial "Django Unchained". 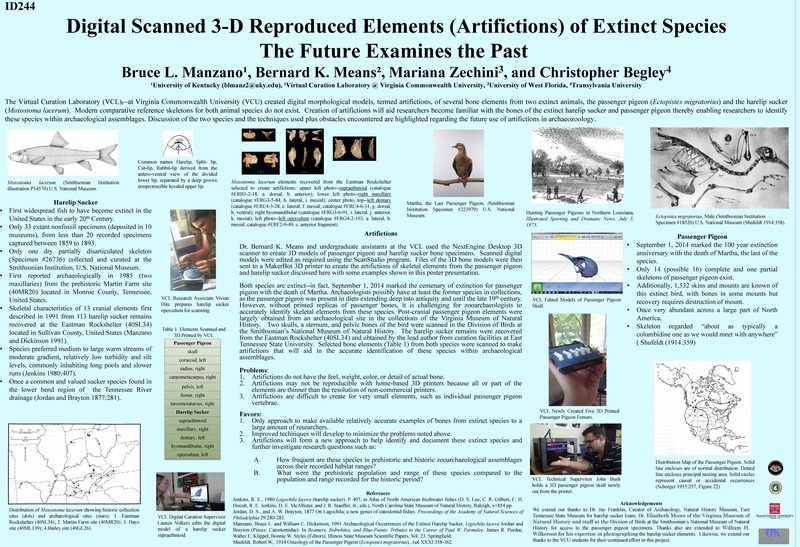 Bruce Manzano presented a poster at the ICAZ 2014 ( International Council of Archaeozoologists meeting in San Rafael, Argentina) featuring research by the Virtual Curation Laboratory and collaborators at the University of Kentucky (Bruce Manzano), the University of West Florida (Mariana Zechini) and Christopher Begley (Transylvania University). He also displayed printed replicas of passenger pigeon bones. You can see the abstract for the poster here. Congratulations to Wanda Hewlett Capers from the School of World Studies for been nominated as a finalist for the 2014 Dorris Budd Douglas Award. Over the summer, SWS Professor Godwin-Jones began to update his database of Grimm fairy tales — which features both German and English translations — starting with "Cinderella." If you want to follow some VCU students learning archaeological field methods in an experiential setting, Bernard Means has created a Facebook page for just that. Check out this video produced by Danny Schmidt that highlights one of the cooperative projects done with Jamestown Rediscovery. SWS Associate Professor of French and Cinema Peter Kirkpatrick was voted the 2014 "Most Successful Diplomat" by Style Weekly and the French Film Festival was voted the " Best Film Festival" for the year. Congratulations! SWS French students at the Richmond International Airport ready to go on their study abroad with The French West Africa Project. Congratulations class of 2014! Check out the pictures of the ceremony on the SWS Facebook page.